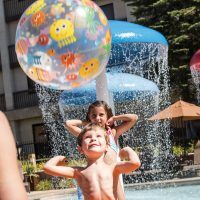 “Cheap” isn’t a word normally associated with New York City (especially Manhattan) as a family travel destination, but there are ways to cut your lodging costs. Timing is an important factor, since rates are much more favorable off-season in the winter months. Regardless of month, these clean, cheap family hotels in New York City — some of them near Times Square — may be manageable expenses. They offer basic amenities in safe — if not entirely central — locations. For families of up to four people, a room with two queen beds in this chain property is well-priced, especially for the quiet eastside location near the Empire State Building. Children stay free with their parents. Furnishings and decor are not luxe, but there are plenty of value-added extras at the Ramada New York/East Side, including free continental breakfast, free Wi-Fi, offsite reduced-rate parking, and guest laundry facilities. The Roosevelt's location on the east side of midtown is a good jumping-off point in any direction, especially with Grand Central Station two blocks away. There's a wide range of room sizes to fit all budgets, from "cozy" rooms to suites with two bathrooms. Since there are no connecting rooms, the larger rooms provide families the most space, along with mini-fridges and microwaves. But the age of this Art Deco building shows. Request a room on the upper floor for less street noise. This cheap family hotel in New York City offers a hybrid hotel room and apartment, at an affordable rate. Among the studios and suites at Radio City Apartments -- most equipped with full kitchens -- three room types will sleep four to five people with a sofa bed. Nice extras include free Wi-Fi and daily gym passes. If you're looking for brand new furnishings, this is not the place for you. But if you want to walk to Times Square within minutes, this is a great choice. For larger families, the BEST WESTERN PLUS Hospitality House, a converted apartment building in midtown, is one of the best cheap family hotels in New York City. It includes one- and two-bedroom suites, with pull-out couches and cribs available. Tall ceilings make the rooms feel even more spacious. Even though the rooms feature fully stocked kitchens with a stove, microwave, and dishwasher, a full breakfast is included, offering a significant savings over the cost of dining out. The hotel has a private garden, and is less than a half-mile from Rockefeller Center and Radio City Music Hall. If you want a boutique, yet cheap family hotel in New York City, try this 131-room property in a 1906 landmark building in the Flatiron district. The glam Art Deco decor and remodeled bathrooms at Park South Hotel make up for the not-so-central location. A complimentary continental breakfast, and even nightly turndown service with chocolates, make you look twice at your bill. Up to four can be accommodated -- snuggly -- in the Superior or Executive-level rooms at this cheap New York City hotel. With its great location near Times Square, the rates at Candlewood Suites Times Square are a welcome find, even if the basic decor is not. Another check in the plus column are the kitchenettes in every room. Suites feature a queen bedroom, with a sleeper sofa in a separate living area. The Dollar Breakfast package includes a hot breakfast for just one dollar added to your rate, making this an excellent choice for a cheap family hotel in New York City. A popular choice for families regardless of budget, The Milburn Hotel is in a family-friendly neighborhood near subway stations, Central Park, and the American Museum of Natural History. The kitchenettes in every room, which include a microwave, mini-fridge, sink, dishes and utensils, allow you to prepare your own meals at a lower cost than dining out. Playstations, children's books, and movies are offered at no charge. A complimentary continental breakfast is also included in the rate, which may help you look past the small bathrooms and occasional maintenance issues that come with an old building. There are two Pod Hotels in New York City, a self-proclaimed budget concept. Small rooms feature very modern, minimalist decor, with single pods sharing bathrooms. But larger rooms do exist and accommodate up to four people. At the Pod Hotel 39, the Double Full has two double beds and a private bathroom. At the Pod Hotel 51, there are two room configurations that will accommodate up to four people. A Double Bunk has two twin bunk beds in one room. The Queen + Mini bunk is two rooms, with a queen bed in one, and a bunk bed with two twins in the other. They both have a private bathroom, and the latter even has a bathtub. Amenities at this cheap New York City hotel include a flat-screen TV, rooftop lounge, and a community playroom with Ping Pong tables. For its Times Square location on the corner of 47th Street and 8th Avenue, the price of a room at the Econo Lodge Times Square cannot be beat. Rooms are small and simply furnished, and there is only one room type, the Harlem Double, that can accommodate a family of four with two double beds. For the price, though, you also get free Wi-Fi, a complimentary welcome snack, continental breakfast and even cookies in the lobby. Up to six people per room can be accommodated in the Junior Suites at this cheap family hotel in New York City's midtown. The heated indoor penthouse pool is a popular draw for families, and the low rate for onsite parking makes Skyline Hotel a property convenient for road trippers. Rooms are basic but large, ranging from 370 to 500 square feet, and each has a mini-fridge. Bring a white noise machine; the walls do not provide enough sound insulation for some reviewers.